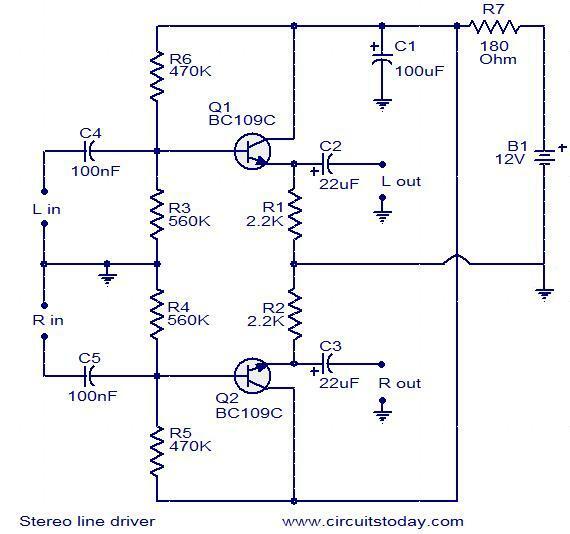 This is the circuit diagram of a low cost stereo line driver is given here. The circuit consists of only two transistors and few passive components. Each BC 109C transistor is wired as an emitter follower for driving each channel. The voltage gain of the emitter follower is unity, but it has a high current gain and low output impedance, ideal for driving long cables. The output impedance is around 16 Ohms at 1KHz.Since voltage gain is unity power amplifiers must be used at the listening end in order to drive loud speakers. The circuit can be powered from a 12V battery or 12V DC power supply. The inputs and outputs must be connected with respect to ground as shown in circuit. A power amplifier is needed at the listening end because the emitter follower has only unity voltage gain. The line driver circuit must be place close to the audio source.